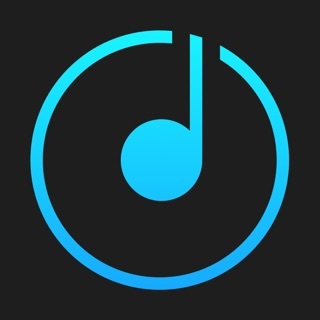 #1 Hi-Res audio player for Mac & iPhone. Music just sounds better! Introducing VOX Premium – Your Ultimate Music Experience. 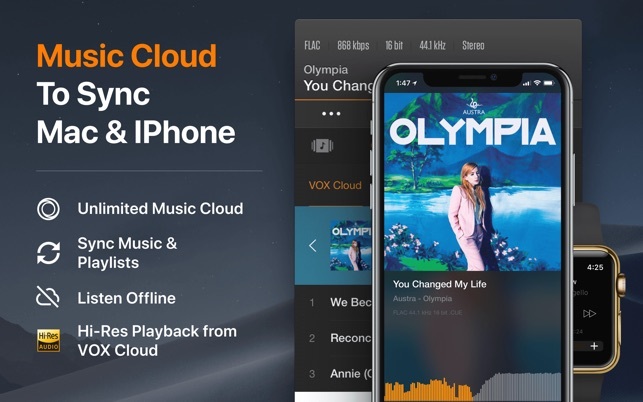 VOX Premium adds a stunning cloud streaming features and unlimited music storage without a decline in quality. Sync, stream and cache your entire music library on Mac and iPhone in a way that suits you best! • Play audio files stored on NAS devices and other network drives. • Get system or Growl playback notifications. • Play any song, any playlist you find on YouTube via VOX FLAC Player, put all your YouTube songs into one media collection. 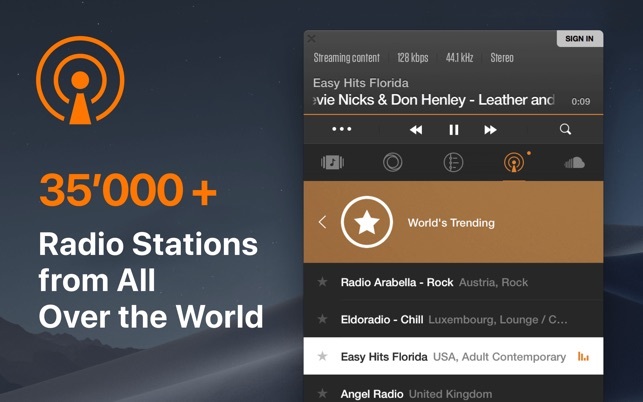 • Bring your SoundCloud stream and likes directly into VOX. • Press CMD+U and paste any link from YouTube to play it in VOX. You can add it to VOX collections as well. • 30'000+ Radio stations categorized by genres and countries! • Take full advantage of AirPlay (10.8+) to listen with any of your wireless output devices. • VOX also supports SONOS wireless speakers systems. 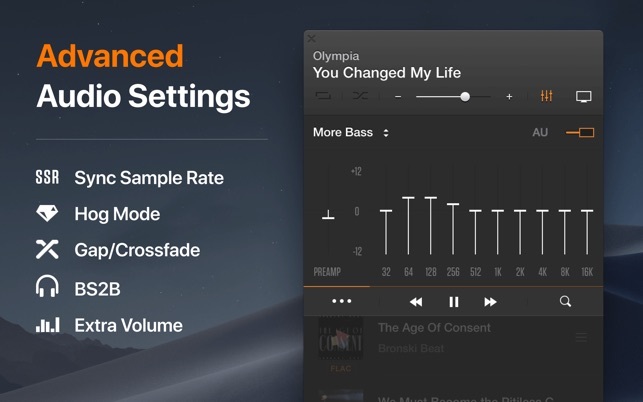 The beauty of VOX Player is in its simplicity, yet behind the minimal exterior lies a powerful Music Player with a ton of features and support for all audio formats you may ever need. P.S. 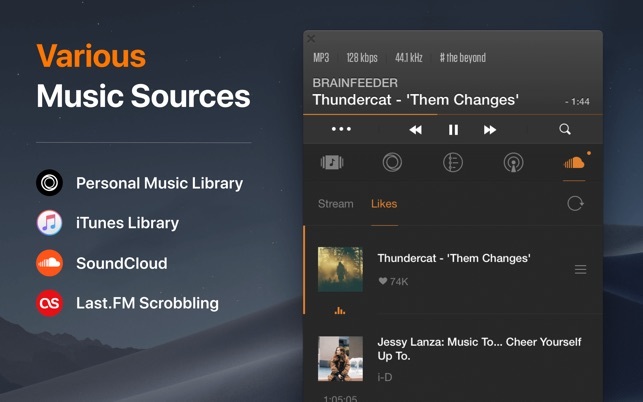 : FLAC Player, ALAC Player, Lossless Player, SoundCloud Stream Solution, YouTube MP3 Music, Hi-Res audio Player - check all of them in one VOX Music Player. - Crash fixes and stability improvements. Update: found the problem, but still an issue. UPDATE: I raised my stars on this app. Since I updated a while back to an 1 teribyte Solid State Drive to make my older mac run faster I ended up moving all of my music and photos to a different hard drive drive then what Apple wants you to put them in. It took downloading another music player app, and that one not working as well, but that app gave me the reason why, it was a “Sandboxing” issue. Seems that VOX and the other app can only access music if it is located in the music folder and no where else. SO this really wasn’t a fault of the VOX creators as much as an Apple security system, so I can't fault them on that. I would sugest that VOX adds some kind of pop up warrning about the Sandboxing issue too, unless they can over come this issue. App worked great for a year. Then one day I hit play and nothing. I watched it go down the music list greying out every song like it could not find it. I tried to delete all the songs and drag them in again and nothing. I contacted the support and they sent me a reset program and instructions and it never worked. I tried to email them back and they never responded back to me. This was last year and I tried to download the lastest version today with the same results today. It was a very simple great music app, to bad it stopped working. Sorry to hear that! We are working to get a major update to get it solved asap. If you've not received a response on our support desk, it might be a spam blocker. Your mail is getting trashed. Please try contacting us - here: https://vox.rocks/support; here: https://www.facebook.com/voxapp/ or even here: https://twitter.com/i/notifications?lang=en We will provide you with an assistant in order to solve the issues which you are facing at the moment! We bring our apologies for this negative UX you had to face with. Please reach our tech. support desk directly - https://vox.rocks/support We will try to find a solution for this and provide you with our assistance. Since last updates, i have a problem with playlists. When i import a music in VOX, the order of some songs will change. For example, i have a album that ordered in track number. When in import it in VOX, track number 4 will go to top of the playlist. So i have to rearrange playlist every time. I don't have this problem in older versions. But this problem appear in new versions, and new updates does not fix this problem. Please fix this problem. Thanks. Thanks for heads-up, this problems, connected with iTunes Playlists only and it will be fixed in nearest future updates of VOX app. As a temporary workaround, we would suggest using VOX, instead of iTunes - for creating and managing your music Playlists.